By the time Gunther Rall led the FW-190’s of JG-300 on their last combat mission of World War 2, he had established himself as perhaps the most remarkable of all fighter pilots. Having joined the war in its early stages Rall took part in the Battle of France, the Battle of Britain, and campaigns in Crete and Rumania, before being posted to the Russian front. By 1944 he was back on the Western Front again commanding successfully JG-11 and JG-300 Fighter Wings, flying the long-nose Focke Wulf 190 in the final defence of Germany. He flew 800 missions, suffered 3 severe injuries, survived seven forced landings, a mid-air collision, and brought his tally of air victories to 275. He flew against the top aces of the RAF in the early part of the war and did battle with aggressive fighter pilots of the USAAF after D-Day in the defence of Germany. In spite of a long period of immobility in 1941/42 after crash-landing and breaking his back, he still recorded the third highest number of air victories in the history of air fighting. Robert Taylor has recreated the scene, high over Germany as the last morning of combat breaks, and the final dramas of the great air war are played out. Rall leads his FW-190 pilots into combat with P-51’s of the United States Air Force for the last time. The unmistakable features of Gunther Rall at the controls of is FW-190 bring a quality of realism to the outstanding work of art. 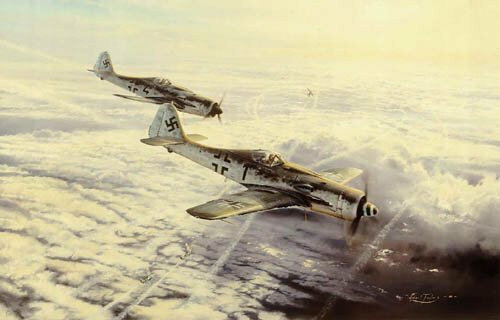 From high in the stratosphere view Rall and his wingmen as they dive their elegant and powerful FW-190’s yet again into attack. Around them swirl the contrails of battle. Below and beyond another duel is fought out between FW-190’s and P-51 Mustangs, and way, way below, and as far as the eye can see, we behold a majestic, magnificently painted cloudscape. 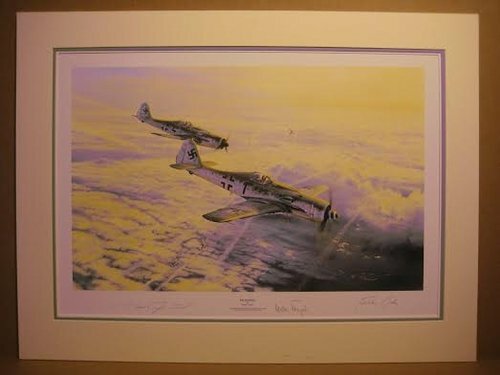 A truly stunning print from the world’s foremost aviation artist.